SIZE: 6# (Bust 34'', Waist 27''), 8# (Bust 36'', Waist 28''), 10# (Bust 38'', Waist 30''), 12# (Bust 40'', Waist 32''), 14W# (Bust 42'', Waist 35''), 16W# (Bust 44'', Waist 37''), 18W# (Bust 46'', Waist 39''). Pls refer to our CMDC SIZE CHART, boby builds vary by person. OCCASION: It's suitable for versatile occasions: wedding, party, business meeting， daily and ect. 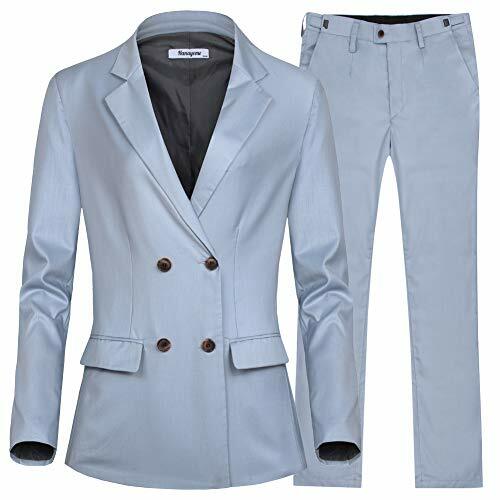 This parcel comes with SUIT & PANTS, which makes you outstanding in the crowd. BLAZER'S FEATURE: Double Breasted, Two Flap Pockets at Sides; Slim Fit Trousers.